The Serious Challenges Facing Investors - Richard C. Young & Co., Ltd.
August has been a stark reminder of the serious challenges facing investors. Those lulled into a sense of complacency from double-digit market gains in 2009 and 2010 were rocked back to reality this month by three events. On Thursday, August 4, the Dow Jones Industrial Average posted its worst point-drop since the financial crises in December 2008. More bad days followed as the Dow dropped 4% during the week of August 15. For the month, the Dow was down almost 4.4%. Concerns are broad. In the U.S., the economy had been much stronger in the first half of last year compared to 2011. Real GDP rose at an annualized rate of 3.9% in the first quarter of 2010 and 3.8% in the second quarter. For 2011, GDP rose at a rate of 0.4% in the first quarter and 1% in the second quarter. In Europe, a debt crisis, which began in Greece, is widening to include far larger economies of Spain, Italy, and even France. While the U.S. has been officially out of recession for two years, the economy is still on shaky ground. If Europe can’t contain its debt crisis, the global economy could suffer a serious blow. Stock market volatility remains a threat. On Friday, August 5, Standard & Poor’s downgraded U.S. long-term debt to AA+ from AAA. As noted in The Wall Street Journal, the downgrade was not a big surprise. “Is there anything that S&P said on Friday that everyone else doesn’t already know? S&P essentially declared that on present trend the U.S. debt burden is unsustainable, and that the American political system seems unable to reverse that trend.” The downgrade further highlights the political mess we have had in Washington for years. Unfortunately, this mess plays too large a role in how the markets move, creating more uncertainty and making investing even more difficult. Not too long ago, corporate earnings momentum and price-to-earnings ratios guided successful investors. Today, the political climate and Fed action are a huge component in gauging the investment climate. On Tuesday, August 9, the Fed, which has kept its short-term interest rate target at near zero for almost three years, announced a two-year extension of the low-rate environment. For most retired and soon-to-be retired investors, the Fed keeping a lid on short rates is a real killer. With millions of boomers nearing the end of their working lives, low rates result in meager returns on fixed-income investments. In 2006, the average one-year CD yielded roughly 3.78% according to Bankrate.com. Those yields today are roughly 0.4%. Average seven-day yields on the more than $2.5 trillion in assets in money-market mutual funds are near zero, at 0.01%, according to data provider iMoneyNet. In 2007 they hovered above 4.5%. Given an environment of high volatility, continued uncertainty, and low interest rates, we believe investors’ equity exposure should feature a concentration of dividend-paying securities. Investing in dividend-paying companies is often seen as a way to defend against big swings in the market. Higher-quality, dividend-paying companies tend to withstand volatility better than lower quality or smaller companies. Dividend-payers also become more appealing in times of turmoil because their payouts help ease the pain from falling prices. And, as long as investors continue to receive their quarterly dividend check, the thinking goes, they are less likely to sell when the market declines. When investing in dividend-paying securities, our goal is not to just choose the highest-yielding companies. An important feature of our strategy is to focus on companies we believe possess the ability and desire to raise dividends annually. Companies with annual dividend increases are usually confident about their future earnings. These companies tend to be stable businesses well positioned in their markets and able to perform throughout market cycles, making them good candidates for long-term growth. Annual dividend increases are also a comfort to investors because of their predictability. Where the stock market will land on any given day, quarter, or year is anyone’s guess. The consistency of annual dividends takes away some of the mystery of investing. A dividend strategy is not just a defensive strategy. Too often, the importance of dividends goes unnoticed, especially the contribution to total return from reinvested dividends. According to research from T. Rowe Price, dividends contributed more than 44% of the total return of the S&P 500 from the start of 1986 to the end of 2010. Reinvested dividends can also provide significant inflation protection in the form of a growing stream of income. For years we have highlighted the benefits of dividend-paying stocks. Our Retirement Compounders equity portfolio is a globally diversified portfolio comprising 32 dividend-paying securities. Our challenge today is finding companies that pay a decent yield. Not only are rates low on fixed-income securities, but they are low in the equity universe as well. By example, the yield today on the S&P 500 is 2.15%—less than half our target yield of 5%. When constructing our Retirement Compounders portfolio, we seek big, blue-chip type companies from across the globe. Canadian, Swiss, and Brazilian shares have been our primary international favorites, but we increasingly favor the Nordics. The Nordics—sans Finland—offer the benefit of no direct euro exposure. For reasons I’ve outlined in past client letters, the euro is a currency we are avoiding. Within the Nordics, Sweden is our favored country today. Though we maintain a position in Statoil, the Norwegian integrated oil company in our Retirement Compounders portfolios, we aren’t buying the Norwegian krone or krone-denominated bonds today. In Sweden, we are buying both equity shares and bonds. What do we like about Sweden? Sweden is the largest of the Nordic countries. It has a population of over 9 million and GDP of more than $400 billion. Sweden is a neutral country and a stable democracy (technically, a constitutional monarchy), and it is, of course, not a member of the euro zone. Unlike the U.S. and many of its European counterparts, Sweden is not burdened by excessive government debt. In fact, Sweden is one of the world’s few developed countries where government financial assets exceed government debt. And even ignoring the government’s financial assets, Sweden’s debt-to-GDP ratio is a moderate 40% and falling. 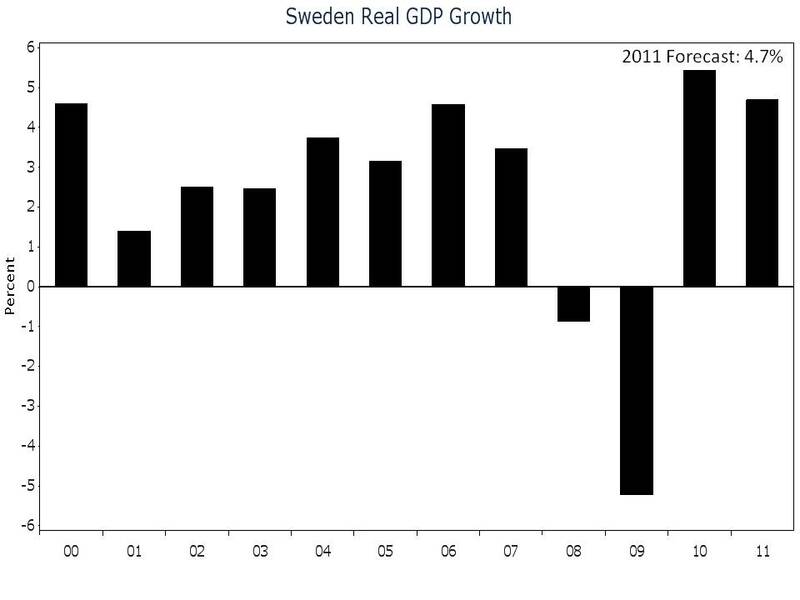 Sweden is also projected to run a budget surplus in 2011 and 2012. Sweden’s strong public finances may even pave the way for a reduction in personal taxes. Contrast that with other countries in Europe and America where austerity measures are likely to act as a headwind to near-term economic growth. In terms of a forward-looking energy policy, Sweden is way ahead of the curve. Sweden’s goal is to be totally oil-free by 2020. Sweden has already reduced its energy-from-oil number to about 30% from near 80% in the 1970s. That’s impressive progress. Renewables are a major part of the equation. Renewables already account for 39% of Sweden’s energy consumption. And by about 2030, Sweden’s plan is to rely on renewable energy to supply two-thirds of its power. Along its coastline, Sweden has built water-power and wind-power plants. Sweden is also in better shape than any other country in the EU when it comes to forests, which puts Sweden in good shape for biomass. In 2009, biomass surpassed oil to become Sweden’s number-one energy source. Biomass today accounts for over 30% of Sweden’s energy needs. In a world of scarce conventional energy resources, a focus on renewables has appeal. From a cyclical perspective, Sweden’s economy is recovering nicely. In 2010, GDP growth was 5.7%, and in 2011, forecasters are looking for growth of 4.7%. In contrast to the Federal Reserve, which continues to repress savers by holding short-term interest rates at zero, Sweden’s central bank, the Riksbank, is tightening monetary policy. Why? Swedish inflation of 3.3% exceeds the Riksbank’s inflation target of 2%. Inflation in the U.S. is 3.6%, but instead of tightening policy, our monetary policy authorities have decided to move the goal post. We are told it is not headline inflation that we should focus on, but inflation excluding food and energy—in other words, inflation excluding everything that is going up in price. Which central bank do you think will be a better steward of your money? At its last monetary policy meeting, the Riksbank raised the repo rate (the main policy rate) by 25 basis points to 2.0%, and signaled that rates will increase gradually to a more normalized level. 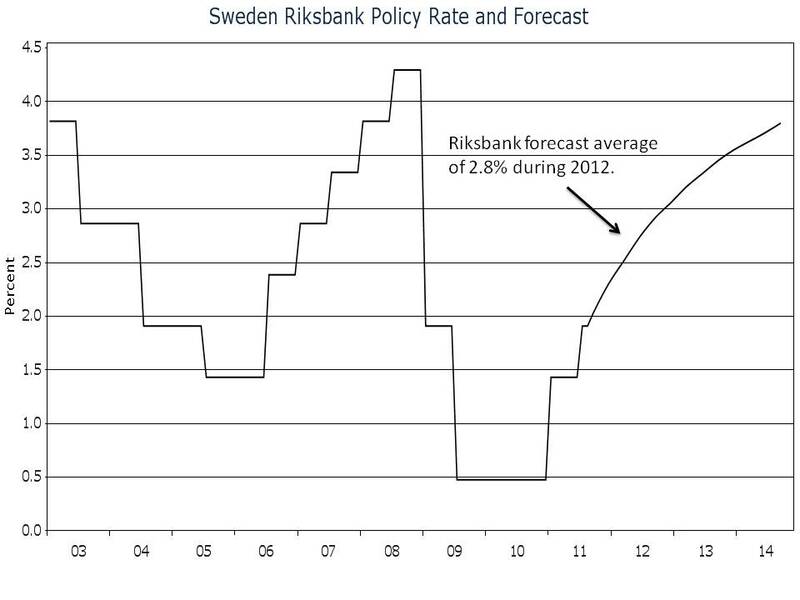 For 2012, the policy rate is expected to average 2.8%. A strengthening economy and rising short-term interest rates are bullish for Sweden and the Swedish krona. An expected current-account surplus equal to more than 6.4% of GDP adds to the krona’s appeal, as does our estimate of the krona’s purchasing power parity (PPP). The krona is the cheapest of the major currencies on the basis of PPP. Our PPP work estimates fair value for the USD/SEK exchange rate at 6.30 compared to a current rate of 6.40. 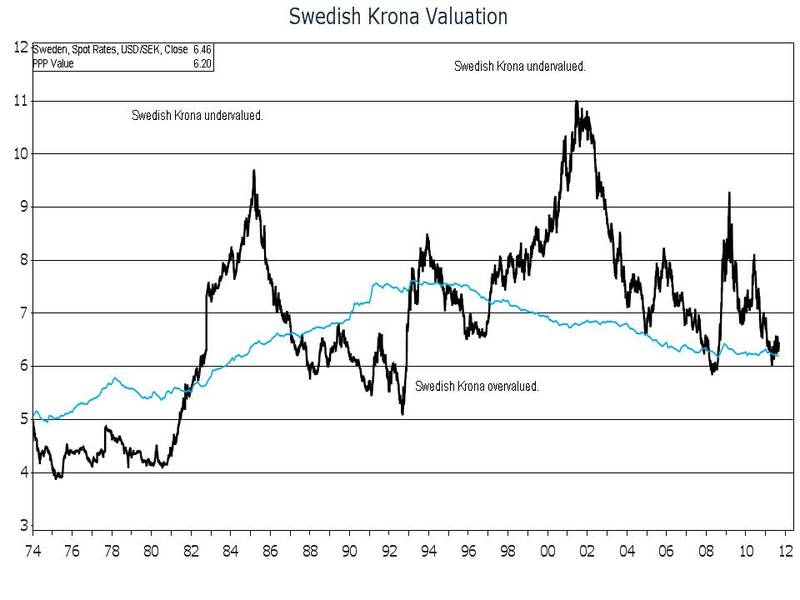 To gain exposure to Sweden and the Swedish krona, we are buying Swedish government bonds and Swedish shares. On the bond side, we’ve purchased short-term government bonds with a yield near 1.5%. Comparable maturity U.S. Treasuries yield less than 10 basis points today. That’s a 1.40% yield advantage for Swedish government bonds. On the equity side of the ledger, we are buying Svenska Cellulosa AB, also known as SCA, and scouting for additional opportunities. SCA develops, produces, and markets personal care products, tissue, packaging, and forest products. The personal care segment sells incontinence care products, baby diapers, and feminine care products. SCA’s brand for incontinence care is the world leader. In baby diapers, the company has a 60% market share in the Nordic region and is making inroads in Russia and Eastern Europe. The feminine care division is the market leader in the Nordic region. In the tissue business, SCA is Europe’s largest, and the world’s third-largest, consumer supplier. SCA’s packaging division is Europe’s second-largest producer of corrugated board and containerboard and one of the largest producers of corrugated board in China. The forest products division includes the sixth-largest publication papers manufacturer and one of the largest solid-wood product manufacturers in Europe. SCA is also Europe’s largest private forest landowner, with 6.4 million acres of forest. SCA is a basic consumer products company with valuable timber assets, a strong balance sheet, and an attractive dividend yield. The shares also appear cheap, trading at a discount to book value and at less than 10X estimated earnings. The firm’s dividend policy is to provide long-term stable and rising dividends. SCA has increased its dividend in 14 of the last 16 years. The only year it was decreased was during the financial crisis in 2008. Over the last 10 years, dividends have compounded at an annual rate of 4.5%. At a 4.7% current yield, SCA’s shares are attractive in our view. Of course an investment in SCA and Sweden is not without risks. Though Sweden doesn’t use the euro, Sweden’s economy would not be immune to a Greek- (or otherwise-) induced euro-area financial crisis. The euro area is one of Sweden’s major trading partners. A recession in the euro area would undoubtedly hurt Sweden and SCA. For SCA this risk is somewhat mitigated by the nature of the company’s products. Diapers, toilet paper, and incontinence products aren’t discretionary items, but a downturn could still hurt the company. As for the krona, the major risk from a euro-area financial crisis would be a flight to the perceived safety of the U.S. dollar. Many global economies are straddled by structural deficiencies likely to weigh on their growth in the short to medium terms. We believe countries including Sweden, Canada, Brazil, and Switzerland are in relatively better shape than their neighbors. Our investment approach in the current environment is one of caution. With U.S. GDP slowing, interest rates low, volatility and uncertainty high, inflation on the rise, and the tax treatment on qualified dividends still favorable, we continue to favor dividend-paying stocks that offer the potential of annual increases. Also, bonds should not be ignored. We do not believe stocks today are cheap, and certain bonds can help dramatically limit portfolio volatility. While bond yields remain painfully low, we believe there are strategies to boost yield without taking ill-advised risk. I’ll go into detail next month. Have a good month and, as always, please give us a call at (888) 456-5444 if your financial situation has changed or if you have questions about your investment portfolio. P.S. In August, we initiated a position in the ProShares UltraShort 7–10 Year Treasury (PST). The fund gains when longer-term interest rates rise. At the time of purchase, rates moved near the panic lows of 2008. With inflation running at 3.6%, long-rates are negative in real terms. At some point, rates will rise, which will benefit PST. No doubt rates could fall further temporarily, but we would view the drop as another buying opportunity. P.P.S. For many clients, we increased their position in BlackRock Dividend Achievers Trust (BDJ). In our view, the volatility in August provided a buying opportunity for BDJ. At the time of purchase, BDJ was selling at approximately a 9% discount to NAV, with a yield of almost 10%. We also bought Procter and Gamble, a company we sold in the past when its yield dropped. More recently, PG’s dividend has been increased without much rise in the share price. As a result the yield has risen to approximately 3.5%. P.P.P.S. Our Retirement Compounders equity program is a globally diversified portfolio comprising 32 dividend-paying securities. Many of the companies, including AT&T, Coke, and Duke Energy are household names. Other companies, primarily the international ones, may not be so familiar. Included on our list of non-household names are Bonterra Energy, Brookfield Renewable Power, and Innergex Renewable Power. All three companies are Canadian, a country we have favored for many years. Canada had no bank bailouts and its unemployment is falling fast. Canada has the first conservative majority since 1993, has balanced its budget, and retired debt by collapsing government spending. Investors are pleased to see its corporate tax rate reduced to 15% and a reduction in its capital gains tax. All of these factors help underpin our continued enthusiasm for Canada as an investment destination.